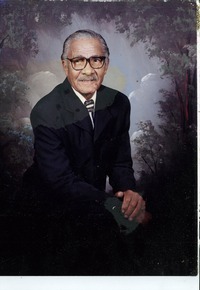 STATESBORO - HILLS, Elder Nathaniel Hills, Sr.
Elder Nathaniel Hills was born into this life on December 25, 1925 to the late Mrs. Lizzie Mae Lee Hills and Mr. James Prince, Sr. in Bulloch County, Georgia. In his 87th season of life, he traded time for eternity on Thursday August 15, 2013 at the East Georgia Regional Medical Center in Statesboro. Nathaniel demonstrated good Christian values. At an early age he confessed his faith and hope in Christ. He first united with God's Greater Mission Holiness Church, Arcola, GA; he later united with Greater Bethel A.M.E Church and was a dutiful member of New Church and Prayer Holiness, Inc., Glennville, GA, where he served in numerous capacities. At the age of 19, Nathaniel decided that he would unite with the United States Army. He was stationed in Fort Knox, KY. After faithfully serving he returned home to Statesboro and was a Heavy Machine Operator. His life was filled with Love and Compassion. He answered the call and was ordained into the Gospel of preaching, teaching and winning souls to Christ. Fulfilling Gods word that two shall become one, in 1997 he married the love of his life, Ms. Lizzie Mae Mitchells. Nathaniel was a gifted and talented musician; he enjoyed traveling to numerous churches showcasing his God given talent. Although they had no children together, this union was blessed with Nathaniel's children: Margetta, Golda, Carla, Nakeyla, Conneilla, Gwenzelda, Emanuel, Nathaniel, Jr, Anthony, Ell Roy, Emmanuel. Waiting for him in the presence of the Lord, his beloved parents; two children, Emanuel Hills and Margetta Hills; a sister, Lessie Durden. Because love is far greater than death he leaves an abundance of memories of the hearts of his beloved wife, Evangelist Lizzie Mae Hills of Statesboro, GA; his children, Golda (John) Cross, Carla Freeman, Nakelya Hills, Conneilla Hills all of Philadelphia, PA, Gwenzelda Parker of Houston, TX, Nathaniel Hills, Jr. of Philadelphia, PA, Anthony Hills of Jacksonville, FL, Ell Roy Hills of Alamo, GA and Emmanuel Hills of California; a sister, Amy Prince of Miami, FL; a brother, James (Reverend Sarah) Prince of Statesboro, GA; 19 grandchildren; 25 great grandchildren 2 great great grandchildren; and a host of nieces, nephews, other relatives, New Church and Prayer Holiness, Inc. Church Family and countless friends. Public Visitation for Elder Nathaniel Hills will be held 12 Noon -6:00 PM on Friday August 23, 2013. The final tribute to his life will be celebrated at 1:00 PM on Saturday August 24, 2013 at Greater Bethel A.M.E Church, 3 Peachtree Street, Statesboro, GA 30458. Bishop Kenny Reynolds, Officiating Prophetess Cynthia A. Reynolds, Presiding. Interment: Georgia Veterans Memorial Cemetery, Glennville, GA.